These are beautiful Alder Pet Urns that hold 35 cubic inches., constructed of solid American Red Alder they are a touching way to remember your pet. Available in three sizes, the Deluxe Alder Pet Urns are grain matched for consistency and finished with a clear lacquer coating. 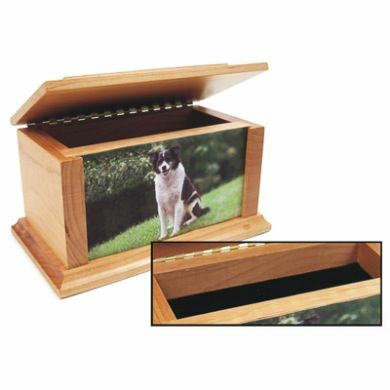 The Deluxe Pet Urn arrives with an area at the top for storing your favorite mementos and an option of engraving the face plate, as with the standard Pet Urns or inserting a photograph with the included glass. The top of the Deluxe Pet Urn can be engraved when the glass and photo are being utilized. The light colored wood engraves a dark brown color, providing excellent contrast for photos and text. Pet ashes are securely sealed from the bottom of all the Pet Urns. Engraving area is 5-3/4" x 3".